At the turn of the 20th century, interest in urban reform reached new and impressive levels. Decades of unprecedented growth and expansion, fueled in large measure by industrialization, created a perfect storm of problems municipal governments were ill-equipped to address. A growing cadre of middle- and upper- class reformers directed their attention to the complex challenges facing North American and European cities. These reformers hoped to solve emerging urban problems because they recognized the essential role of the city in modern life as well as its potential to promote social progress and the highest ideals of human civilisation. The articles in this issue examine the ways urban reformers—mayors and city planners, in particular—confronted the serious trials of modern urban life and, in doing so, contributed to a transatlantic dialogue about the nature of progress in the modern industrial world. Although they utilized different approaches, the leaders drew from a common pool of ideas that challenged traditional laissez-faire attitudes about government and recognized an expanded role for the state as a positive agent in social and economic development. Towards that end, many supported public ownership of natural monopolies such as power, gas, and water. They also pursued policies that promoted greater civic awareness and interest in the city as a collective experiment in self-government. Such policies included the construction of public farms, parks, libraries, sewage facilities, and bathhouses. In this introduction, I will first provide a brief overview of the evolution of attitudes toward the city—from a necessary evil to the prime catalyst of national social and economic development. Following that, I will summarize each of the articles in this issue. Social and economic life in colonial cities was highly regulated, and unapproved exploration beyond the town’s borders was strictly prohibited. Despite the restrictions against, and dangers associated with, expansion, the diffusion of settlers into the North American back country outpaced the growth of American towns and cities throughout the 18th and most of the 19th centuries. In 1800, only 6 percent of the American population lived in urban places of 2,500 or more. By 1820, that number had only grown to 7 percent (U.S. Census Bureau 1949: 24). Cities in the early decades of the 19th century were relatively small and focused on commercial activity. Most of the workforce was still directly involved in the production of goods, with as many as one-third of workers involved in skilled or semiskilled labor (Klein and Kantor 1976: 71). Within a relatively short time-frame—from roughly 1820 to 1870— the nature and size of the city changed rapidly. Powered by new and improved sources of energy, the machine replaced manual labor as the dominant source of productivity. The shop system was supplanted by large and impersonal factories. New cities formed, and old cities re-formed around those factories, which processed raw materials and manufactured finished products on an incredible scale. Demanding a steady stream of workers, urban populations ballooned. In 1840, nearly 2 million or 12 percent of the U.S. population lived in urban areas. In 1860, that number had jumped to 24 percent of the total population, and by 1890, more than one-third of the American people lived in urban places (U.S. Census Bureau 1949: 24). In addition to adding more people, urban economies specialised in one or two major industries, which provided the bulk of city jobs and wealth. For Chicago, that industry was wholesale slaughtering and meatpacking, for Philadelphia it was carpet and rugs. Specialisation was even more pronounced in smaller urban areas. In 1900, for example, Troy, New York produced 85 percent of the total value of cuffs and collars sold in the United States. Similarly, Baltimore, Maryland contributed 64 percent of the total national value of canned oysters (U.S. Census Bureau 1902: ccix). *Alexandra W. Lough holds a Ph.D. in American history from Brandeis University where she completed a dissertation entitled, “The Last Tax: Henry George and the Social Politics of Land Reform in the Gilded Age and Progressive Era.” She currently serves as the Director of the Henry George Birthplace, Archive, and Historical Research Center located in Philadelphia, PA.
More information is available on her website: alexandralough.com. American Journal of Economics and Sociology, Vol. 75, No. 1 (January, 2016). VC 2016 American Journal of Economics and Sociology, Inc. In the early 20th century, Cleveland was the eighth largest city in the United States, the largest city in one of the leading industrial states in the nation. To become mayor of this city and a leader in Ohio politics made one a national figure. Moreover, during the first three decades of the 20th century, Cleveland grew much faster than any city in the United States, with the exception of Detroit. By 1930, Detroit was the fourth largest city in the United States, followed by Cleveland in fifth place (Gaffney 2006: 31–32). Both of those cities were doing something right. To attract hundreds of thousands of new residents meant that their local economies were creating huge numbers of new jobs. What was the secret of their success? Much of Cleveland’s success a century ago was due to Tom Lofting Johnson, its dynamic mayor from 1901 to 1909. As a former businessman, he knew how to make a city attractive to business. As a social reformer, he knew how to make a city attractive to the ordinary citizen and worker. How did Johnson come to be the mayor of a leading American city, and how did he make it even more prominent during his time in office? At the age of 30, Tom Johnson had already climbed the ladder of business success. He was an inventor, steel manufacturer, a street railway monopolist, and a millionaire. He could have piled millions more into his personal treasury if he had chosen to, perhaps becoming a titan of industry. But in 1883, Tom Johnson experienced a change of heart. On a train between Indianapolis and Cleveland—two cities in which he owned majority shares of the streetcar industry—a porter offered the heavy-set southerner a copy of Henry George’s Social Problems (1883). Johnson (1911: 48–49) later remembered: “The title led me to think it dealt with [prostitution], and I said as much, adding that the subject didn’t appeal to me at all.” Overhearing the remark, a conductor promised Johnson a refund if he did not find the book of value. No refund was necessary. Johnson recalled that he read it “almost without stopping” and became a firm believer in Henry George’s ideas. Johnson wanted either to confirm or repudiate George’s theories by discussing them with his closest friends and colleagues. After reading George’s 1879 masterwork, Progress and Poverty, Johnson (1911: 49) said to his lawyer, L. A. Russell: “You made a free trader of me; now I want you to read this book and point out its errors to me and save me from becoming an advocate of the system of taxation it describes.” Russell could not find any errors. Nor could Arthur J. Moxham, with whom Johnson owned and operated a steel mill that manufactured the girder groove rail Johnson had invented. Having confirmed the validity of George’s ideas to his own satisfaction, Johnson (1911: 51) met with Henry George during a business trip to New York in 1885 and asked him: “I can’t write and I can’t speak, but I can make money. Can a man help who can just make money?” George assured Johnson that he could help and convinced the monopolist not to abandon his business, but to continue to make money and promote his “single tax.” Some historians have tried to cast doubt on Henry George’s influence on Johnson’s life and political career. Holli (1970: li–liii) claims that “there is little external evidence” to prove George converted Johnson to a life of reform or that his ideas informed Johnson’s policies as mayor. Instead, Holli argues that George merely provided “spiritual succor” to Johnson, especially during the final weeks of his life when he dictated his autobiography. “In some respects,” Holli writes, “the teachings of the ‘saint’ of the single tax were a surrogate religion that Johnson never had, and they provided the former Mayor with a kind of Christian symbol that linked him to the past and possibly to the future.” While there is little doubt the two shared a spiritual bond—Johnson purchased burial plots next to George’s in Brooklyn’s Greenwood Cemetery long before his final illness—there also is little reason to question Johnson’s claim that George transformed his outlook on life and business and that George’s ideas played a prominent role in his political program for Cleveland (Johnson 1911: 55). Upon his election to mayor of Cleveland in 1901, Johnson promised to bring fairness and scientific precision to the valuation of private property, lower the cost of vital public services, such as streetcar fares and water, and allow the people a greater role in governing the affairs of their city. All of these undertakings relied on and incorporated the core principles of the single tax. *Alexandra W. Lough holds a Ph.D. in American history from Brandeis University and currently serves as the Director of the Henry George Birthplace, Archive, and Historical Research Center. ABSTRACT. Hazen S. Pingree was a remarkable civic leader. In his four terms as mayor of Detroit from 1889 to 1897, Pingree lowered the cost of vital public utilities, including gas, lighting, and transit; modernised the city’s sewage system; and rooted out corruption and dishonesty in municipal government. He successfully spearheaded the movement for the three-cent streetcar fare and brought Detroit to the brink of public ownership and operation of its own transit system. Pingree’s social reform program for Detroit centered around two interrelated urban reform movements gathering steam at the turn of the 20th century: the movement for municipal ownership and the movement to equalise taxes by increasing taxes on corporate property. Both of these movements drew heavily from Henry George’s single tax. In particular, Pingree’s efforts to secure a municipally owned and operated street railway system and effort to increase taxation on corporate property illustrate the ways in which turn-of-the-20th-century civic leaders drew from the rhetoric and substance of George’s ideas to implement progressive urban reforms. By most accounts, past and present, Hazen S. Pingree was a remarkable civic leader. In his four terms as mayor of Detroit from 1889 to 1897, he lowered the cost of vital public utilities, including gas, lighting, water, and transit; modernized the city’s sewage system; and rooted out corruption and dishonesty in municipal government. He successfully spearheaded the movement for the three-cent streetcar fare and brought Detroit to the brink of public ownership and operation of its own transit system. At the height of the Depression of 1893–1894, he instituted one of the most famous systems of outdoor relief. Pingree’s Potato Patches, as the system became known, provided free farms to poor families on unused land where they could grow, among other things, potatoes. Pingree also oversaw the construction of new parks, better schools, and public baths. At the end of his fourth term as mayor, state voters elected him to the governorship where, in two terms, he helped pass one of the most sweeping tax reform bills in the state’s history. In 1985, urban historian Melvin Holli (1999) conducted a national poll among urban scholars and journalists to find the 10 best and worst big city mayors in the United States since 1885. Pingree came in third, just below Fiorello La Guardia (1934–1945) of New York and Tom Johnson (1901–1909) of Cleveland. Pingree was not just a remarkable mayor, he also was a pioneer. When Pingree first assumed local office in 1890, Holli (1969: 157) pointed out that, in the United States, “there was not a single municipal model after which Pingree could have fashioned his social reform programs for Detroit.” In the era of machine politics and boss rule, most other big city mayors prioritized structural improvements designed to make municipal government more efficient and less corruptible. Such reforms included new city charters, improved auditing and accounting mechanisms, and electoral reform. Pingree also pursued structural changes. He secured, for example, expanded veto powers, and he fought for a new city charter. But he also discovered early in his political tenure that the complexities of urban life demanded a more robust social program. In prioritizing social justice over political change, Pingree crafted a new model of municipal reform. Pingree’s social reform program for Detroit centered around two interrelated urban reform movements gathering steam at the turn of the 20th century: the movement for municipal ownership and the movement for tax equalization. Both of these movements drew heavily from Henry George’s single tax. In particular, Pingree’s efforts to secure a municipally owned and operated street railway system and increase taxation on railroad property illustrate the ways in which turn-of-the-century civic leaders drew from the rhetoric and substance of George’s ideas to implement progressive urban reforms. Besides his incorporation of single-tax principles, Pingree’s success in passing meaningful social reform also depended on his ability to enforce political loyalty, willingness to sacrifice personal time and money for his causes, and direct appeals to the city’s voters. Although highly critical of the machine-style politics practiced by political bosses like New York’s William Tweed or George Cox of Cincinnati, Pingree utilized some of their same techniques to remain in office and win support for his programs. As Dorsett (1972: 151– 152) has pointed out: “The Pingree organization assessed political appointees for campaign funds and made loyalty to the mayor’s principles a requisite for keeping jobs.” Additionally, Pingree chose not to prosecute prostitution, violations of the state’s Sabbath laws, or illegal liquor sales. “Accepting support from the underworld,” Dorsett continued, was “part of the machine tradition.” To Pingree, however, these “unsavory” practices were mere symptoms of the much more serious social problems of unemployment, low wages, and the rising cost of living. land was soon available.” Similarly, when Pingree discovered that the gas companies in Detroit had been overcharging customers— including himself—he successfully filed a lawsuit, demanding reimbursement. As a wealthy man, the lawsuit served the mayor’s larger purpose of demonstrating that his administration would not tolerate dishonest business practices. *Alexandra W. Lough holds a Ph.D. in American history from Brandeis University where she completed a dissertation entitled, “The Last Tax: Henry George and the Social Politics of Land Reform in the Gilded Age and Progressive Era.” She currently serves as the Director of the Henry George Birthplace, Archive, and Historical Research Center located in Philadelphia, PA. More information is available on her website: alexandralough.com The author presented a version of this article at the Joint Conference of the Council of Georgist Organizations and the International Union held August 4–9, 2015 in Southfield, MI. 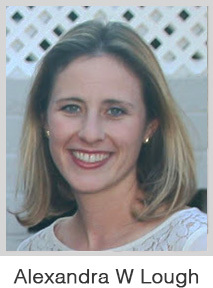 Alexandra (Alex) is a historical consultant specializing in American political, social, and cultural history. She holds a Ph.D. in American History from Brandeis University and currently serves as the Director of the Henry George Birthplace, Archive, and Historical Research Center. Alex is working on a book manuscript based on her 2013 dissertation, The Last Tax: Henry George and the Social Politics of Land Reform in the Gilded Age and Progressive Era.